In this third part of our Blender to OpenGL ES tutorial series, learn how to implement a simple shader to showcase your model! Welcome back to the three-part tutorial series that teaches you how to make an awesome 3D model viewer for iOS by exporting your Blender models to OpenGL ES. Part 2: In the second part, you learned all about the MTL material definition and file format, which allowed you to add Blender materials to your model. Part 3: You are here! Get ready to implement a simple lighting model for your 3D scene by writing your own OpenGL ES shaders! A shader is a dedicated program that instructs a graphics processor how to render a scene. The Return Of The King, The Dark Knight Rises, The Last Crusade… all great trilogy conclusions, but none like this one: GLBlender3! /Blender/: This folder contains the Blender scene for your new model (starship.blend). 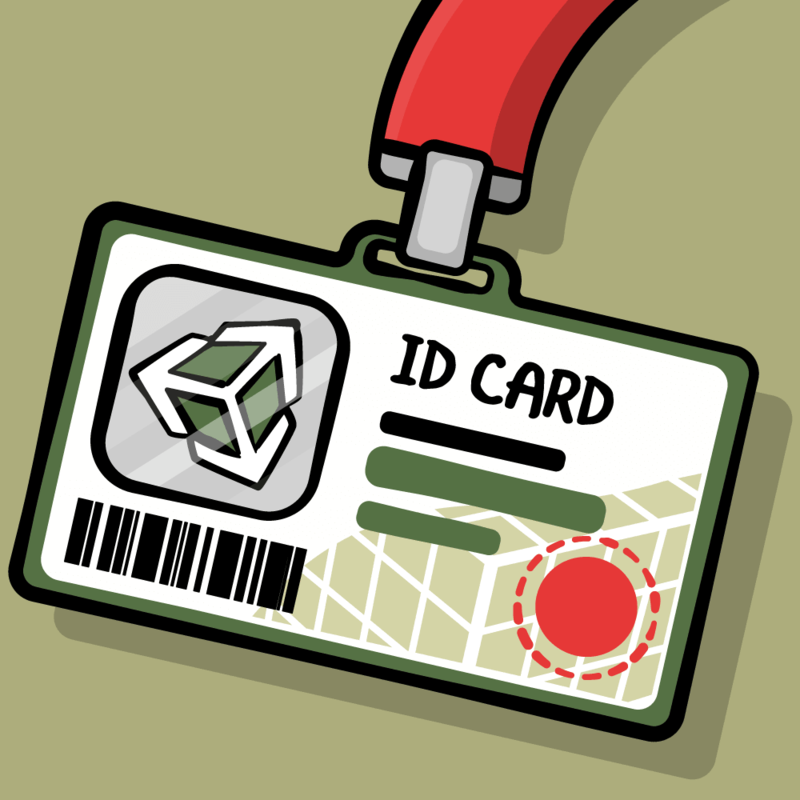 You won’t have to open it in this tutorial, but it’s there if you want to explore or modify it. 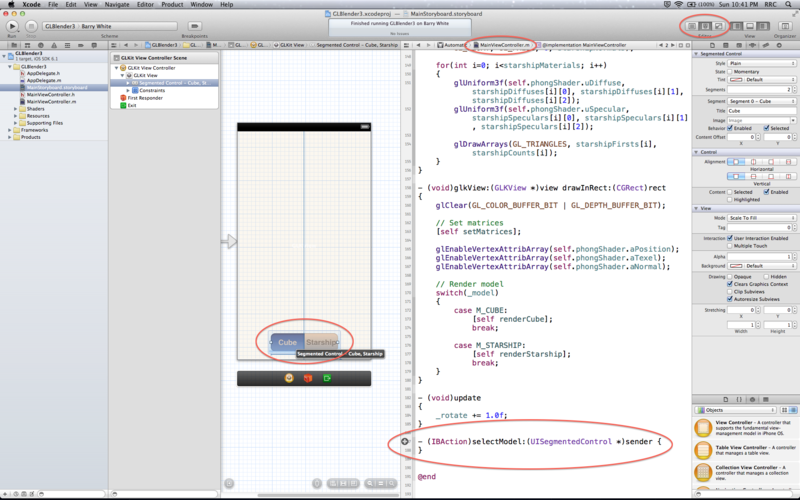 /Code/: Here you’ll find the Xcode project for your iOS app (GLBlender3). The iOS app is the same as GLBlender2 from Part 2, but with a different model (and additional resources). The project also has an extra class called Shader that you’ll use later on. Your command line tool is gone since you completed it in Part 2 and won’t be needing it here. 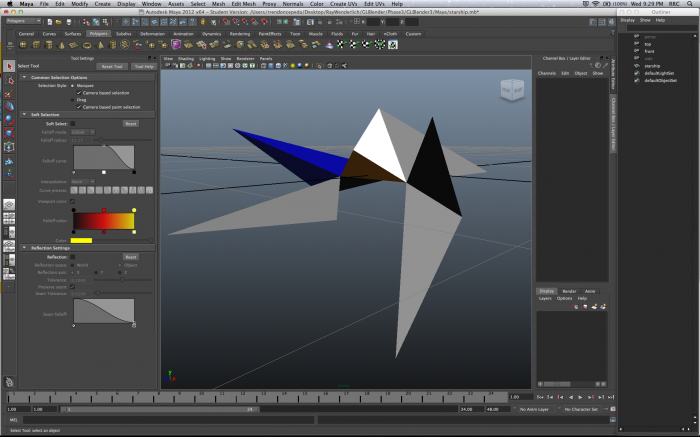 /Maya/: This folder contains the Maya scene for your new model (starship.mb). The model was built in Maya and then exported to Blender, so this is the original copy. Again, you won’t have to open it in this tutorial, but it’s there if you want to explore or modify it—if you have Autodesk Maya, of course. /Resources/: This folder contains two subfolders: /cube/ and /starship/. They both contain all of your models’ files required by OpenGL ES and a few extras. Inside /starship/ you’ll find starship.obj and starship.mtl, which were exported from Blender and then processed by blender2opengles (from Part 2) to create starship.h and starship.c. starship_decal.png is a texture for your model that you’ll use later on. 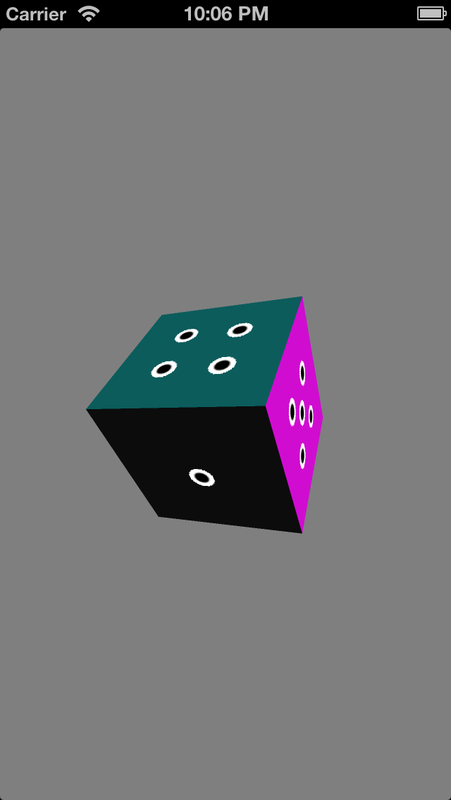 You can find similar files for your cube model from Part 2 in /cube/. This time you won’t be accessing or modifying your directory as much, but it doesn’t hurt to be neat and tidy. I chose this model for its popularity, simplicity and historical significance in 3D computer graphics. If you open starship.obj and starship.mtl with a text editor, you should be able to analyze the file quickly to understand the model a bit better. You could do the same with starship.h and starship.c, but these might be a little more daunting. I’ve done all of the file exporting and processing for you already, so let’s jump straight into the app! Launch Xcode and open your GLBlender3 project. Build and run! You’ll see your new model in all its polygonal glory. 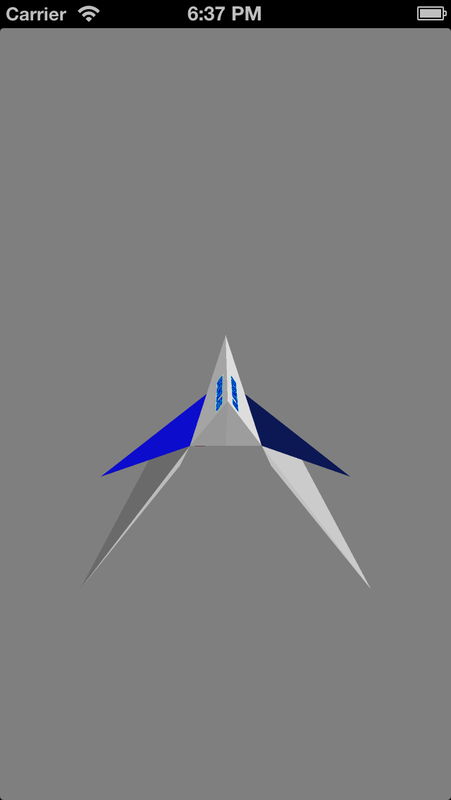 Let the animation run for a little while and you’ll witness some odd behavior, most noticeably when the fins (blue) overlap with the wings (gray). GL_CULL_FACE works well with your previous cube model because there is no instance where two front-facing triangles overlap each other. With this new starship model, though, this happens many times. Culling is still very useful, but now you must also introduce a depth buffer. You’re going to use your storyboard to modify your rendering, so open MainStoryboard.storyboard and click on GLKit View. In the Utilities sidebar, click on the Attributes inspector tab and select 16 from the Depth Format drop-down menu. This creates a depth buffer for your OpenGL ES scene with a 16-bit entry for each pixel. While you’re here, it’s not a bad idea to improve the quality of your rendering. In the same sidebar, select 4X from the Multisample drop-down menu. You should be careful with multisampling because it incurs a huge increase in memory/processing requirements, though with the simple starship model, that’s not an issue. With 4X enabled, you are essentially rendering to a frame buffer object (FBO) four times the size of your screen (2x width, 2x height) and then scaling the resulting image down to the proper screen size. Build and run! Your model now renders properly and looks much better, too. You’re about to take a deep dive into 3D graphics programming by writing your own shaders! You learned a little bit about shaders in Part 2 and now you’ll get to see them in action. The gist is that they are programs that instruct the GPU how to draw your scene. A vertex shader is called once per vertex in your scene. In this tutorial, the vertex shader’s main job is to compute a value for gl_Position, which contains the position of the current vertex. A fragment shader is called once per fragment in your scene. Fragments contain the raw data necessary to generate a pixel, including color, depth and transparency, whereas pixels are the actual points on your screen/image. The terms are used interchangeably, but it’s definitely worth knowing the difference. In this tutorial, the fragment shader’s main job is to compute a value for gl_FragColor, which contains the color of the current fragment. Note: Both shaders get called on every frame, but one more than the other. 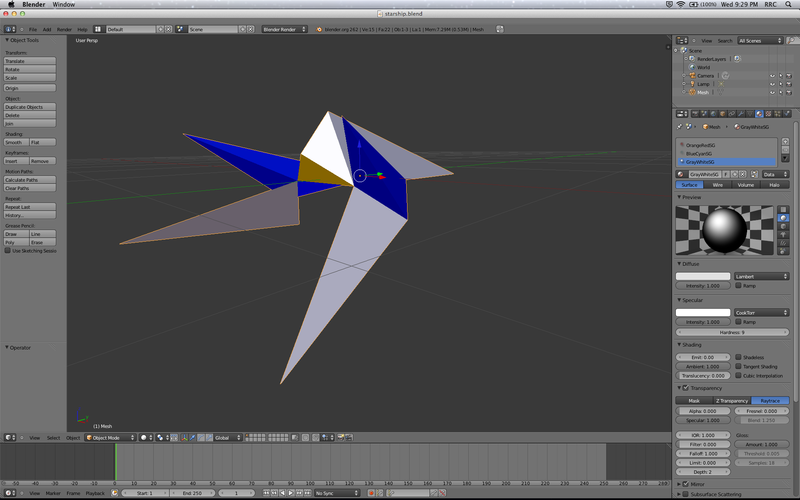 Your starship has 66 vertices, equaling the number of calls to your vertex shader. For an iPhone 5, your scene contains 640×1136 pixels multi-sampled at 4X, meaning your fragment shader could get called up to 2,908,160 times—holy macaroni! OK, it’s time for you to add some shaders to your project! Repeat this process once more, but name this second file Phong.fsh. To get that nice syntax coloring, go to Editor\Syntax Coloring\GLSL. 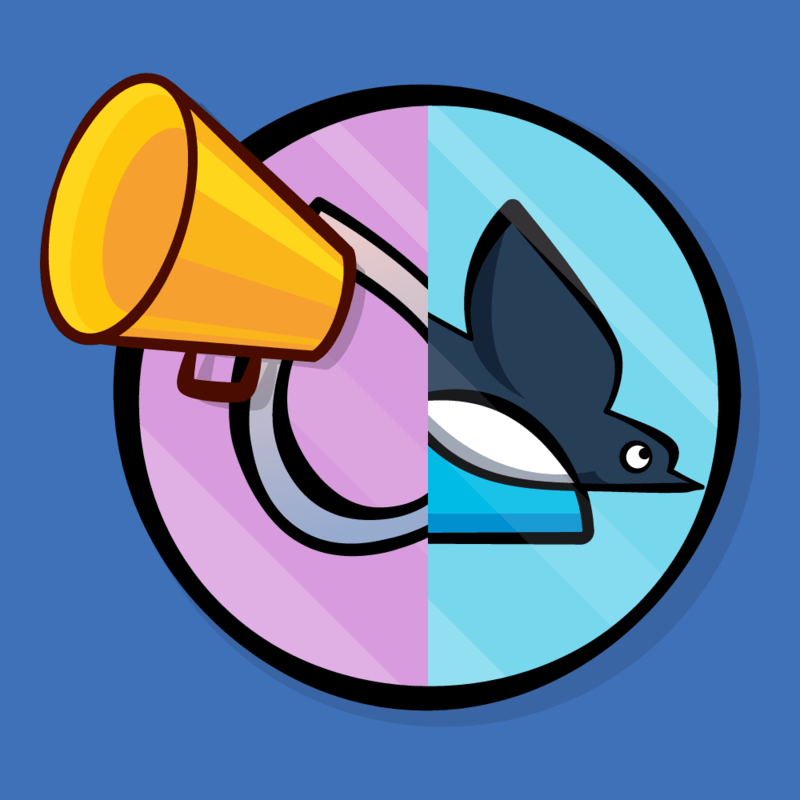 Do this now for both files. As you can see, shaders are short programs written in a C-like language called GLSL (OpenGL Shading Language). They are processed as strings, which is why they are wrapped inside STRINGIFY, a macro you’ll call later that returns a pointer to a string. As mentioned before, the vertex shader writes out data to gl_Position, which expects an XYZW coordinate. In this tutorial, you only need to worry about the XYZ part, since W will always be 1.0 in representation of points, not vectors. The fragment shader writes out data to gl_FragColor, which expects an RGBA color. For the most part, you’re only concerned with the RGB channels, but A will be useful later on when you implement transparency. Attributes typically change per vertex and are thus exclusive to the vertex shader. Your model’s positions and normals change per vertex, so you declare them as attributes. Uniforms typically change per frame and can also be implemented by the fragment shader. Your scene’s projection and model-view matrices affect all vertices uniformly, so you declare them as uniforms. Varying variables act as outputs from the vertex shader to the fragment shader—geometry first, coloring second. Furthermore, vec variables refer to vectors with two, three or four components and mat variables refer to matrices with 2×2, 3×3 or 4×4 dimensions. This tutorial will cover uNormalMatrix and vNormal later, but for now know that they’re both essential to your model’s normals and how they affect the lighting of your starship. Remember the scary calculations that showed how many more fragments than vertices there could be? Every little bit of optimization helps avoid a nightmare filled with millions of fragments. This is why your fragment shader variables require a precision qualifier such as lowp, mediump or highp to determine the range and precision of your variable. You can read more about them in the docs, but your scene will be so simple that you’ll be totally fine just sticking to highp. GLKEffectPropertyMaterial also sends its diffuse and specular color data to a shader, but you don’t get to see that. Here, you’re doing exactly the same and you get to define your own shading model! Let’s start with a simple one. Your shaders are all set, but they happen to live in the GPU, far away from your CPU-based app. In order to get all your model’s data from your app to your shaders, you need to build some sort of “bridge” to connect the two. It’s time to ditch GLSL and switch back to Objective-C! Click File\New\File… and choose the iOS\Cocoa Touch\Objective-C class subclass template. 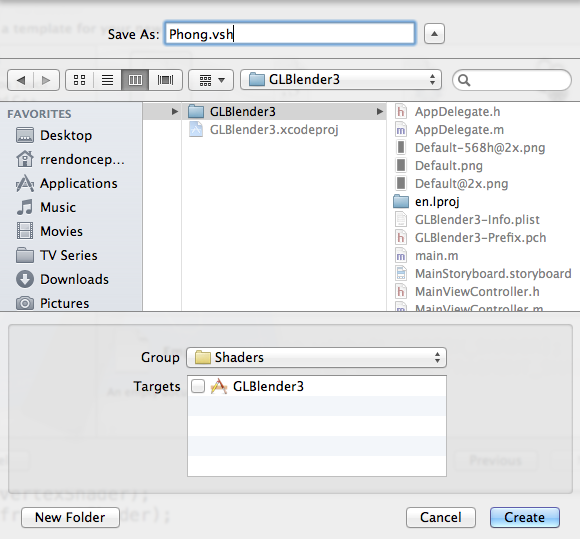 Enter PhongShader for the class and Shader for the subclass. Make sure both checkboxes are unchecked, click Next and then click Create. With this list of properties, you create a set of handles for your GLSL variables—notice the identical naming. The only new variable is program, which I’ll explain in a moment. All properties are type GLint because they are only indices to your shader variables—they’re not the actual data. There’s your STRINGIFY macro! This converts your shaders into strings so they can be processed by the GPU. You can learn more about stringification here. Since your shaders run on the GPU, they’re only readable at runtime with OpenGL ES. That means that the CPU needs to give the GPU special instructions to compile and link your shaders into a single program. 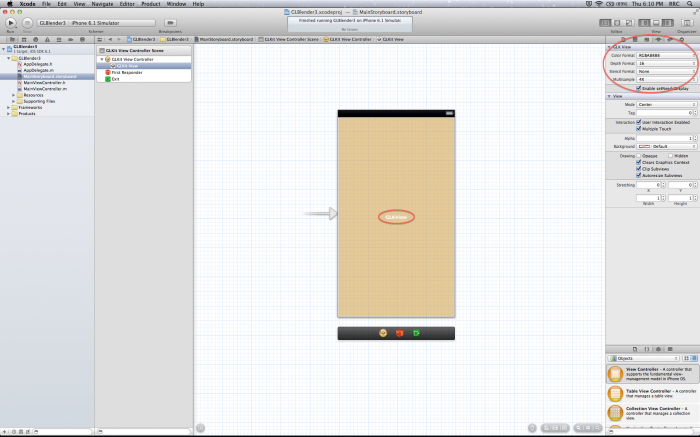 The OpenGL ES 2.0 for iPhone Tutorial covers this process in detail, so give it a read for more information. The program creation functions from said tutorial have been encapsulated in your Shader class for an easy implementation here. You create your CPU-GPU handles by referencing your shader variable’s name and program. For calls to glGetAttribLocation(), the first parameter specifies the OpenGL ES program to be queried and the second parameter points to the name of the attribute within the program. Similar to the above, for calls to glGetUniformLocation(), the first parameter specifies the program to be queried and the second parameter points to the name of the uniform. Good job—your bridge is looking pretty sturdy! Time to send your shaders some meaningful data from your app. Xcode won’t like that and will flag a ton of errors for you, but you’re here to say goodbye to GLKBaseEffect and say hello to PhongShader. Xcode just needs to be more patient. There are just a couple more to go, but you can already see that you are replacing GLKBaseEffect line-by-line. This way, I hope you can appreciate its underlying shader-based functionality. These calls are slightly more complex, but really you’re just telling OpenGL ES the location of your shader’s uniform variable and the data for this variable. Everything remains the same except the attribute index. Drum roll, please… Build and run! Your starship appears with its geometry and materials intact. You’ve pretty much replaced GLKBaseEffect with your own shader, note for note, and got a pretty good result by simply mixing your diffuse and specular colors. Also called Phong illumination, this is the mathematical model that will light your scene. But first, let’s discuss the normal matrix. Most lighting calculations are done in eye space to account for viewer-perceived effects such as specular highlights. The model-view matrix exists in object space, so you need a way to translate normals into eye space. 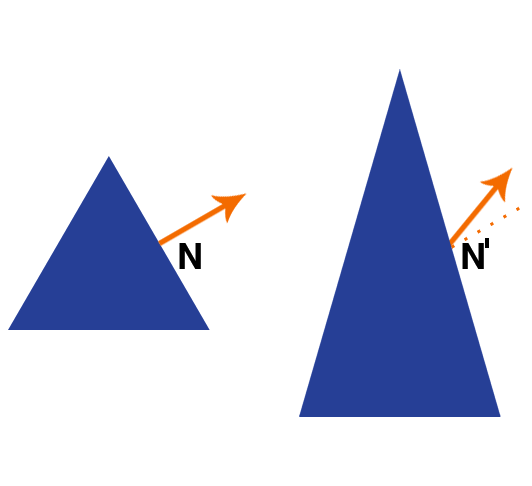 N is a normal on the triangle before any modifications. After stretching the triangle along the y-axis, N’ would be the resulting “normal” if the model-view matrix were applied to the normal N. Clearly, this result is wrong because it is no longer perpendicular to the triangle. Normals are essential to Phong illumination, so you need a way to transform them into eye space while conserving their orientation—enter the normal matrix. A full mathematical explanation is available from Lighthouse3D, but all you need to know is that the normal matrix is the 3×3 inverse-transpose of the model-view matrix. That looks quite nice. GLKit is phenomenal in providing a top-notch 3D math library, which makes the normal matrix implementation a breeze. Don’t worry about invertible and its warning—you won’t have any problems with it in this tutorial, but GLKit requires it. Moving on, who’s ready for more math? You are! The image above describes the three main components of a surface in the Phong reflection model. Let’s introduce a new term, ambient, which accounts for the uniform lighting that affects an entire scene equally, caused by the scattering of light. Think of it as the base intensity and color of your scene; in the real world, rarely do you find yourself in “pitch black” conditions. In the above graphic, the object is rendered under a pure white light, which your implementation will also assume. There’s an additional term, shininess, not pictured above, which simply defines the size of your material’s specular highlights. There is an inverse relationship between shininess and highlights: a shiny mirror has a clear reflection with small highlights, whereas glossy paper has a blurry reflection with large highlights. L, which is the directional vector from the surface point to the light source. N, which is the normal of the surface point. R, which is the reflection of the ray of light L against the normal N.
V, which is the direction from the surface point towards the viewer. All vectors are normalized, since this model only uses the direction of these vectors to perform the scene’s illumination. More sophisticated lighting models, like area or spotlights, factor in the distance of these objects. Material: Ambient (ka); Diffuse (kd); Specular (ks); Shininess (α). Light: Ambient (ia); Diffuse (id); Specular (is). Vectors: Light (L); Normal (N); Reflection (R); Viewer (V). 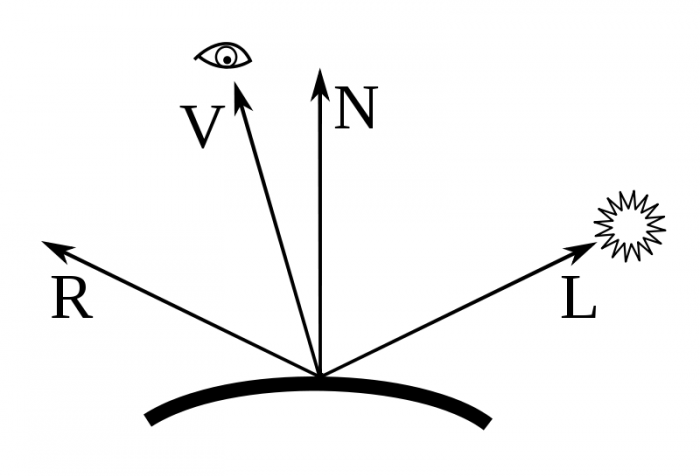 Furthermore, the equation is well separated into ambient, diffuse and specular terms, where L.N and (R.V)^α may even be referred to as the diffuse and specular factors, respectively. 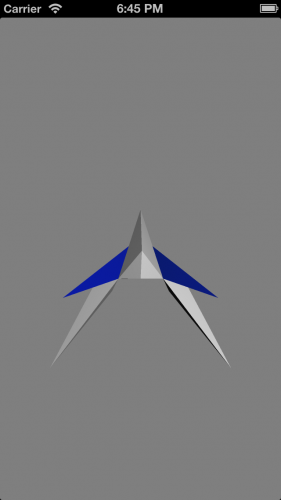 Per-vertex lighting indicates that the lighting calculations are performed at each vertex in a triangle and then interpolated across the triangle. Per-pixel lighting indicates that the inputs to the lighting calculation are interpolated across a triangle and the lighting calculations are performed at each fragment. So basically, use per-vertex lighting to boost your performance and use per-pixel lighting to improve your image quality. In this case, your scene is so small that you can use per-pixel lighting for a better-looking model without incurring a noticeable performance hit. You carry on the diffuse (kd) and specular (ks) components of your material from your starship model. Ambient shading (ka) is 5% white and shininess (alpha) is 1 (no effect on the highlights). 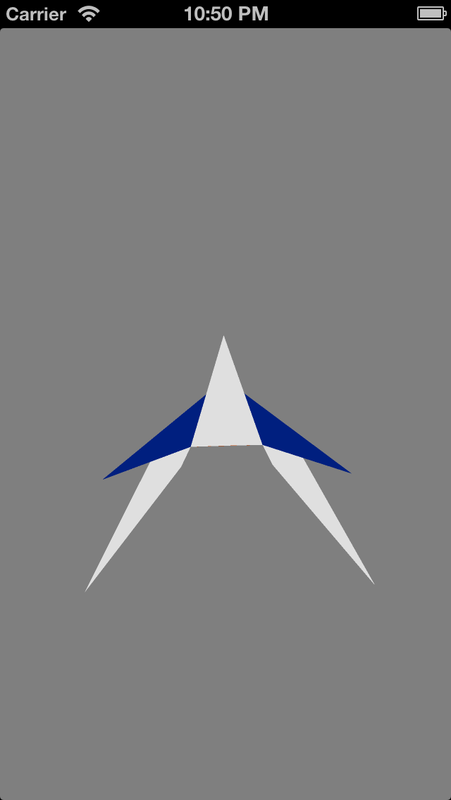 Since your starship model is made up of hard and flat triangular faces, it doesn’t have the curved shape necessary to really showcase specular highlights. All light components are pure white, meaning that your model’s materials are in charge. As mentioned before, all vectors in the Phong reflection model are normalized. Just like your GLKBaseEffect implementation, your light source is in the top-right corner of the scene, behind the viewer. Similarly, the viewer is looking at the model straight-on, with the line of sight into the screen. There is no such thing as negative lighting (true black is 0.0), so the max() function ensures your diffuse and specular factors are always in range. If you’re wondering, a negative dot product between two vectors would occur if they are facing in opposite directions. Finally, plug all of your components into the equation. Build and run! Your starship looks fantastic and you can now see all the different shading intensities and even the cyan color that was hard to appreciate with GLKBaseEffect. Textures and materials aren’t mutually exclusive, so let’s bring textures back into your app (but don’t call it a comeback). You’ll be implementing a decal texture, which is a sticker-like effect transferred onto a surface that retains its own characteristics, like vinyl car graphics. Take a look at starship_decal.png in your /Resources/starship/ folder to give yourself an idea of what you’ll be adding to your model. You’ll start the implementation in your shaders. With these three lines, you’re simply passing your aTexel attribute to your fragment shader via vTexel. Remember that fragment shaders can’t access attributes, so the varying type solves your problem here. sampler2D is a special GLSL variable exclusively used for 2D texture access. It’s attached to a predetermined texture—more on this later. texture2d() extracts the RGBA color value of a texture (uTexture) at a certain texel point (vTexel). Since a decal works like a sticker, your shader will make a decision based on the alpha value of decal: if there is a graphic, stick it onto your model’s surface; if there isn’t a graphic, let the calculated Phong illumination define your model’s surface. Notice that your scene affects neither your decal’s color nor its intensity. Next, open PhongShader.m and add the following lines to init in their respective attribute and uniform sections. There, your updated bridge is all set! Let’s move onto the actual texture now. glBindTexture() specifies the target to which the texture is bound. In this case, your decal is a single 2D texture. glUniform1i() sends the texture to your shader. You send a 0 because you only have one active texture in your program, at the first position of 0. While your starship looks amazing, it would be a shame not to see your cube from Part 1 and Part 2 rendered with your new shaders. It would be too easy to just replace every instance of starship with cube in your source code, so instead you’ll implement a new structure extendable for multiple models. The next steps in this section are essentially a light refactor of your code to create a variable-dependent rendering scenario based on the value of _model. First up is your texture loader. This simple switch statement makes sure your program loads the correct texture for each model. That looks a lot nicer, doesn’t it? The rendering loop can get quite complicated in a large graphics scene, so allowing simple calls to functions like renderCube or renderStarship makes life much easier. Build and run... Whoops, your cube is way too close! It’s actually twice the size of your starship model, so you’ll have to scale it down. Since you now have two models to show off, as the final step in this tutorial you’ll be implementing a simple UI element to switch between the two while your app is running. Open MainStoryboard.storyboard and add a Segmented Control to your GLKit View. With your new segmented control selected, look to the sidebar on your right and click on the Attributes inspector tab. Choose 2 for the number of Segments and name them Cube and Starship (in the Title field). 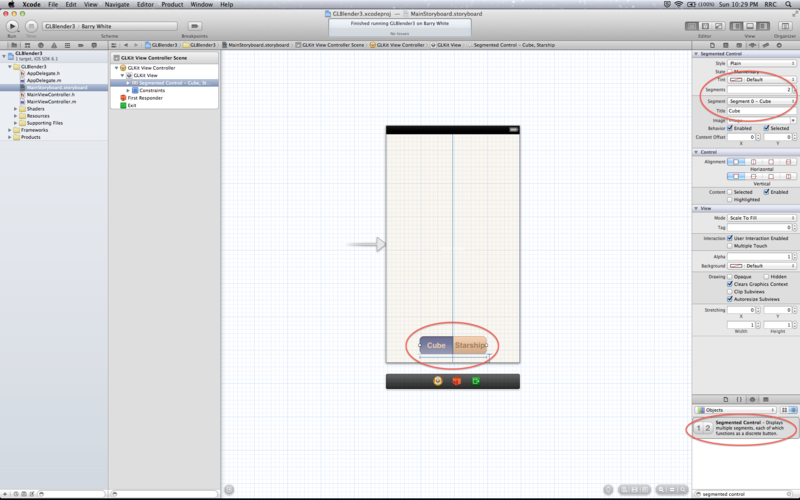 Next, show the Assistant editor in Xcode with MainStoryboard.storyboard in the left window and MainViewController.m in the right window. Click on your Segmented Control, then control+drag a connection from it to MainViewController.m. This creates an Action in the file. With this, you have a control that determines which model to render. When a user selects a new model, the app loads its texture with a simple call to loadTexture. You want to treat OpenGL ES nicely, so performing the model switch between two calls to self.paused ensures you aren’t switching data in the middle of a render. Build and run! Use your new UI to switch between your models with ease. The transition and experience should all be very smooth—good job! 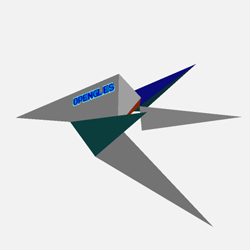 Congratulations, you’ve completed the entire Blender to OpenGL ES tutorial series! This was a challenging series, with Part 3 being particularly rewarding because it took you deep into OpenGL ES shaders and lighting/shading theory. More impressively, you pretty much replicated a big portion of Apple’s very own GLKit framework. Now that you’ve completed this three-part series, you should have a very good understanding of back-end computer graphics, command line tools, geometry and materials, mathematical illumination models, shaders, CPU-GPU communication, rendering and a whole heap of low-level graphics! These are all advanced programming topics not for the faint of heart, and you should feel proud of yourself for getting through them. 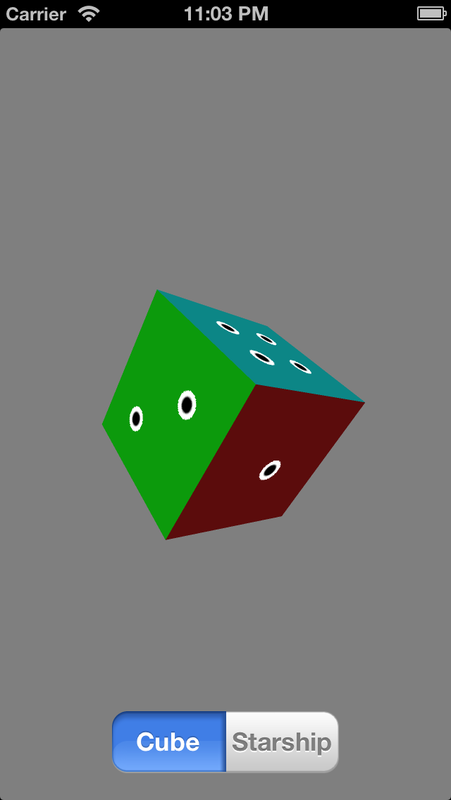 Try implementing the Blinn-Phong shading model. Write a Point Light shader. Parse the specular coefficient Ns of a material. Or maybe just open Blender and make a Porygon model (please do! ).